When Ji-Yun photographs bodies in particular positions, inspired by yoga postures, carefully crafted and framed, we get the feeling of perfect, almost abstract, plasticity of the body. The “sculptures” that these bodies represent, then placed in the space of the photograph, have a smooth and perfectly executed character that makes a kind of hieroglyphics. Only the performance staged by the artist herself, allows us to reattach these shapes to living matter. This plasticity is indeed something both enigmatic and disturbing. The face disappears as does as any identifiable image of a full body, to reveal a composition in which the limbs are all assembled into a form that is both elegant and somewhat monstrous. 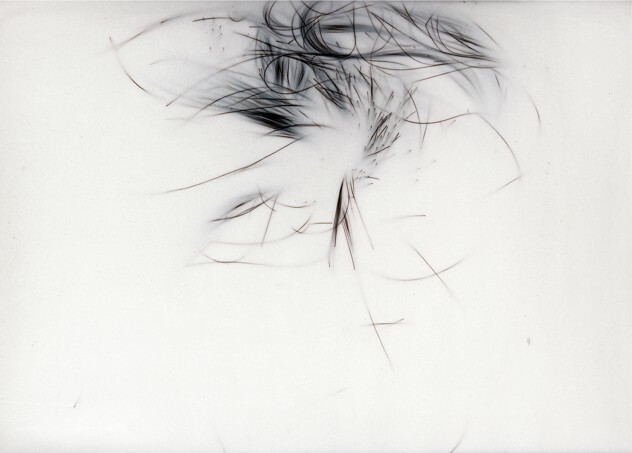 In recent work, the limbs themselves disappear, using various tricks of staging, to reveal nothing more than a tangle of hair, in some cases reduced to just a few strands, a subtle calligraphy just barely emerging from the white background in which it is embedded.These are the remarkable drawings by the artist that help us, as is often the case, to penetrate into the work that seems elusive to us. Some of these drawings are preliminary sketches used for the production of photographs, but much of this work exists for itself and allows us an insight into the inner universe of Ji-Yun. We discover an imagination in which proliferate monstrous bodies, most often devoid of limbs (with the exception of the legs or feet that seem to be the only link to these strange beings with the outside world). It is not impossible that we should see in these visions the childhood memories left by her time spent in the world of the hospital and the disabled. But whatever the reason, Ji-Yun finds and reinvents the body without organs that haunts the drawings and the writings of Antonin Artaud, and of which Gilles Deleuze and Félix Guattari gave the best analysis we know (*). What strikes us is not so much the grotesque character and disturbing features of these drawings, as the power they generate. They are the opposite of “good shapes”, a place where visions and the most profound energies thrive. “Wing” illustrates the working process of Ji-Yun. 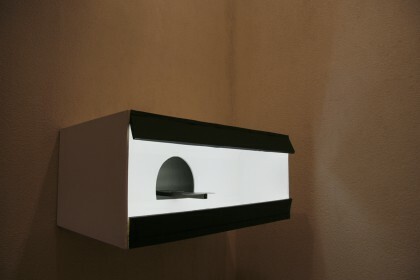 Installed in a light box in a yoga posture, her body appears as an image, up front and ambiguous, consistently maintaining a degree of tension. Rounds, spirals, stars: Once again, you have to look twice for a choreography of bodies revealing its ambiguities, for spirals of hair that hold us captive with their tentacles, for a hairstyle ready to come alive and start to crawl like a crab. Discomfort and beauty.